(a) Using a screwdriver, disengage the 4 claws and remove the 4 clips labeled A, 2 clips labeled B and grille. (a) Remove the screw and 3 clips. (b) Partially remove the fender liner. HINT: It is not necessary to fully remove the fender liner completely. Partially remove it so that the bumper cover can be removed in step (4). (a) Put protective tape under the front fender. (b) Remove the 6 screws. 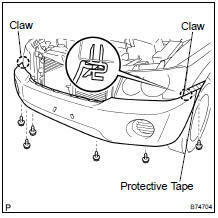 (c) Using a screwdriver, disengage the 2 claws and remove the bumper cover. 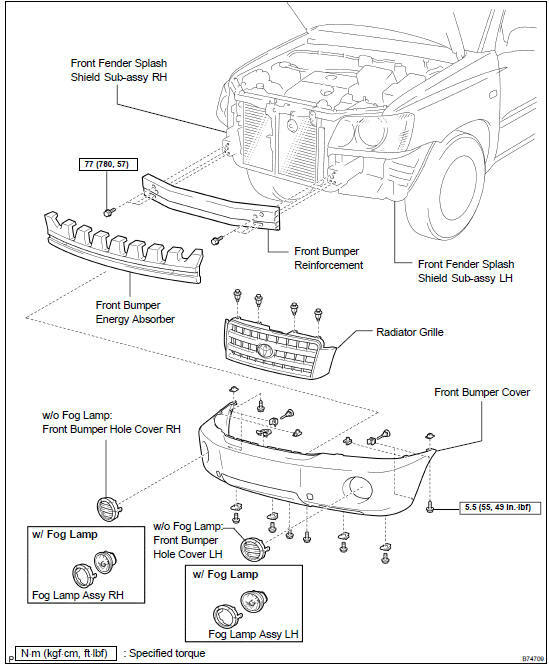 (d) w/ Fog lamp: Disconnect the 2 connectors. (a) Install the reinforcement with the 6 bolts. (a) Install the bumper cover with the 6 screws.